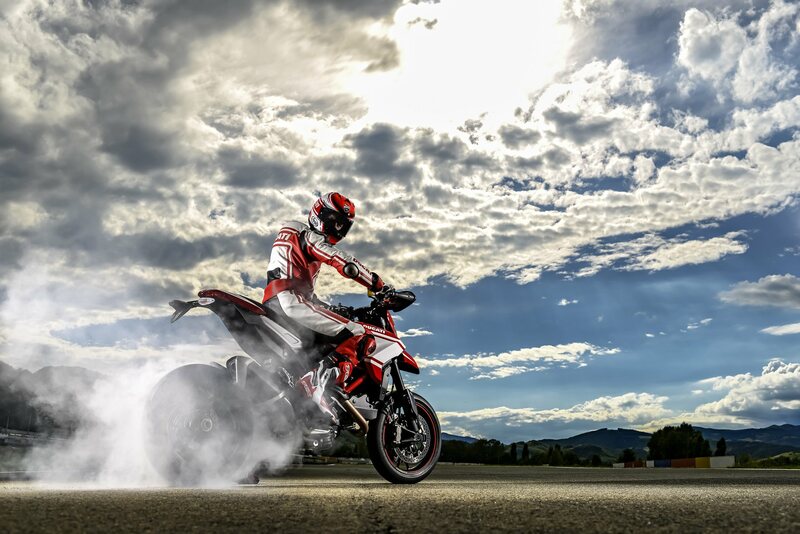 This years World Ducati week saw Ducati unveiling the 2015 Ducati Hypermotard SP. Unvelied by Troy Bayliss and Carlos Checa, the 2015 edition comes with a special red-white combo. The engine on the the 2015 Ducati Hypermotard SP is the Testastretta 821cc engine that produces 110 HP. It comes with some fancy electronics like 3 race modes (Race, Sport and Wet) and also 3 level ABS and 8 level traction control. Other features include pressurized, fully adjustable 50 mm Marzocchi USD forks,17-inch Marchesini 3-spoke forged aluminium alloys, Pirelli Diablo Supercorsa SP tyres (120/70 front, 180/55 rear) and fully adjustable Ã–hlins monoshock. There is a lot of Carbon fibre thrown around in areas like the front mudguard and the engine cover, all this meaning the 2015 Ducati Hypermotard SP weighs just 171 kilograms dry. Ducati have chosen to keep the pricing same as the 2014 version and the bike will be available from September internationally.